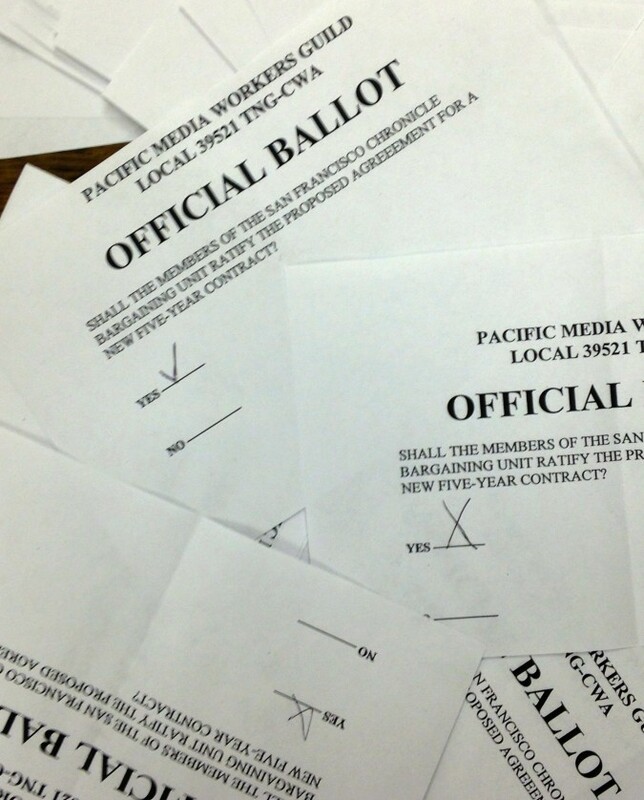 After 16 months of bargaining, Guild members at the San Francisco Chronicle ratified by a 10:1 margin a new five-year contract Wednesday night that provides annual raises, but also means big changes in their health care plan. “We came very close to turning this into a major labor dispute – the company may not appreciate how close,” Hall said. At issue is losing the union-administered Taft-Hartley health plan that has been in place since 1964. The union strived to keep members’ costs as low as possible, and staff was able to answer questions and solve problems without multiple levels of bureaucracy. The contract, covering about 265 workers, is retroactive one year. As a result, members will immediately get a 3 percent raise, plus retroactive pay totaling about $1,000 at the top of the pay scale, minus withholding. They will get subsequent 1.5 percent annual raises. They will also get a payout from the Taft-Hartley plan’s trust fund, probably $1,000 to $1,500 per employee, Hall said. The amount depends on how much of the plan’s reserve is left at the end of 2013 when the changeover to the Hearst-run system takes effect. For some employees, the raises will balance out hikes in health care costs, and some will come out ahead if they choose high-deductible options, Hall said. But families and people with chronic medical conditions may have few options to avoid paying more out of pocket for coverage comparable to what they have now. Because of rising expenses, Hall said members’ health care costs would have gone up even if the existing system remained in place. Guild bargainers fought to preserve the union-administered multi-employer plan, but the company refused to increase its contribution. Hearst was the only large employer left to help close the system’s operating deficit. The union put together a strong campaign that included rallies outside the building, a social media blitz, website testimonials from members already struggling to pay for their own or their families’ health care and even Band-Aids stamped “Hearst Health Plan” passed out at work. But the company wouldn’t budge. Ultimately, Hearst offered to add a year to the contract, and an additional 1.5 percent raise, pushing pay up a total 7.7 percent by the end of the agreement. The company also agreed to settle a Guild grievance involving a new temporary reporter position. The new contract provides for up to five temporary reporters hired for up to two years, the first at 80 percent of scale and the second at 90 percent. If they remain after that, they would receive full scale and permanent status. While the company gets a discount on the starting wages, the Guild gets jurisdiction over the jobs, recouping some ground lost during previous bargaining rounds when Hearst was threatening to close the Chronicle. The new contract contains no concessions beyond the switch to the Hearst health care program, which will be offered to Guild members on the same terms as management. The bargaining team agreed to recommend the deal to members.